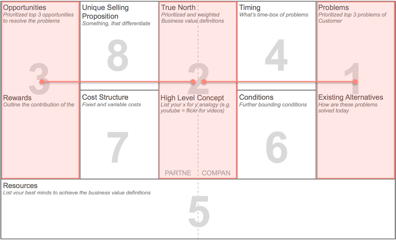 Inspired by the lean canvas of Ash Maurya and the Business Model Canvas from Alexander Osterwalder I first started to design a new adapted version. After some iterations and problem/solutions interviews, experiments and real case implementations I’d like to present you the current version 1.7. We have on the right hand side all about the company, that is evaluating a new partner (left hand side). Main question is, can they both together achieve the main goals in the middle? Is ONE page really enough? Wouldn’t that be awesome, but how this fits in a lean evaluation process of just some days?-Easy as that, we just do it the same way as in service delivery: AGILE! Setup an agile x-functional evaluation team, that contains the people that will cooperate with the new partner, extended by other stakeholders needed. The x-fuctional evaluation team has to have the competences to decide. Define the high-level requirements your own within the x-functional evaluation team. Focus to the main Sections of the lean canvas first and prepare all appendix’ you think are needed. Invite then potential partners/vendors, that you think could do the job and provide them your prepared informations in advance. Based on that, they should show up with all resources of the potential delivery team and other stakeholders. So that the vendor has a x-functional evaluation team in the room, that is able to decide as well. The clue is now, that the Lean Proposal Canvas is worked out together with the partner in an agile approach. That means in several iterations of e.g. planing, break out sessions, hack-rooms, reviews, demo’s, etc. The Lean Proposal Canvas is evolving section by section. Where needed appropriate appendix’, such as a e.g. a go product roadmap, are developed together. So that we have a completed Lean Proposal Canvas and a feedback/decision at the end of the execution day. This could be repeated with further candidates. Choose 1-2 potential partner to go into the next stage agile delivery. After the final decision we immediately wanna start agile delivery. If there is still uncertainty, it might be an option to choose e.g.the best two potential partners and go with both in a proof-of-concept. This will be even cheaper, than switching in a later state (similar to a late bug detection the costs increases exponentially). Further materials will be published soon! What goals we have achieved already? ✅ As less as possible preparation is needed: We do most at the ONE day (3.) all together. ✅ Fokus lays on evaluation of partner too (Soft- & hard skills): While we create the Lean Proposal Canvas and it’s appendix’ together we learn how the potential partner and it’s team members behave, think and feel. Now, I’m keen on your feedback. Do you have similar experiences, what do you think is missing, wont work, etc? Dieses Material steht unter der Creative-Commons-Lizenz Namensnennung - Weitergabe unter gleichen Bedingungen 4.0 International. Um eine Kopie dieser Lizenz zu sehen, besuchen Sie http://creativecommons.org/licenses/by-sa/4.0/.